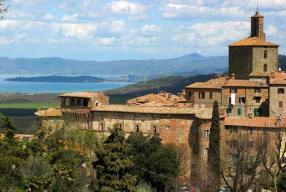 Panicale, as it is the case for most of the villages of the region, still maintains a medieval aspect due typically to the remains of the old town-walls and the fortified doors. Although the church of the Madonna of the Slabs and that one of S. Augustin are by far remarkable buildings, the main attraction of the village has to be found in the magnificent views one can benefit on the Trasimeno Lake and the valley of the Nestore torrent. To whom, however, artistic works are more interesting, good reasons to visit in Panicale the church of S. Sebastiano, are offered by two frescoes of the Perugino: "Martyrdom of St. Sebastiano" and "Incoronazione di Maria" as well as by the beautiful facade of the Collegiata, which locates in St. Michele square.